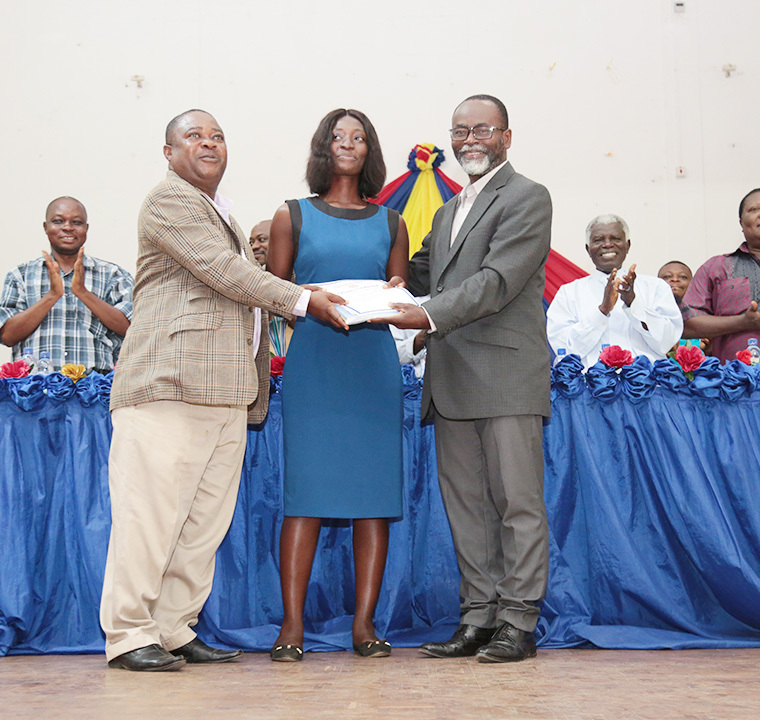 The School of Physical Sciences, has honoured 75 students who excelled academically during the 2017/2018 academic year. The students comprising levels 100 to 300 with Cumulative Grade Point Aggregate (CGPA) of 3.6 and above were presented with certificates and cash prizes at the 2018 Dean’s Awards Ceremony. Ms. Angelica Maisuh, a level 200 Bachelor of Mathematics with Economics student was adjudged the overall best student with a CGPA of 3.91. Speaking at the function, the Dean of the School of Physical Sciences, Prof. David K. Essumang, said the awards ceremony was instituted to encourage students to work towards achieving academic excellence. He indicated that since the awards ceremony was instituted, the School has witnessed dramatic increase in the number of students within the first class category. “With the introduction of the Dean’s Award, we have realised that departments that were not recording first class on consistent basis can now have students within this category” he noted. To the award winners, he advised them to work towards maintaining their current CGPA adding that “If you can’t add anything to it then don’t fall back”. To those who could not receive awards, he urged them not to be discouraged but put in extra efforts to make it in the subsequent awards ceremonies. Prof. Essumang said the School was going through several developments aimed at promoting creativity and innovation among students. He said the School could now boast of a merger laboratory that would be used to train students on how to build electronic gadgets like robots. “We encourage students with brilliant ideas to come out so that we can support them to refine these innovative ideas to solve societal problems,” he told them. The Provost of the College of Agriculture and Natural Science, Prof. Livingstone Sam-Amoah, congratulated the lecturers at the various Departments of the School for producing such brilliant students. He told them to be proud of their achievements and aspire for excellence both in their academic career and personal endeavours. Prof. Sam-Amoah commended the School for achieving remarkable and sustainable impact in the performance of their students. He pledged the College’s support to promote and create an enabling environment for students to excel.